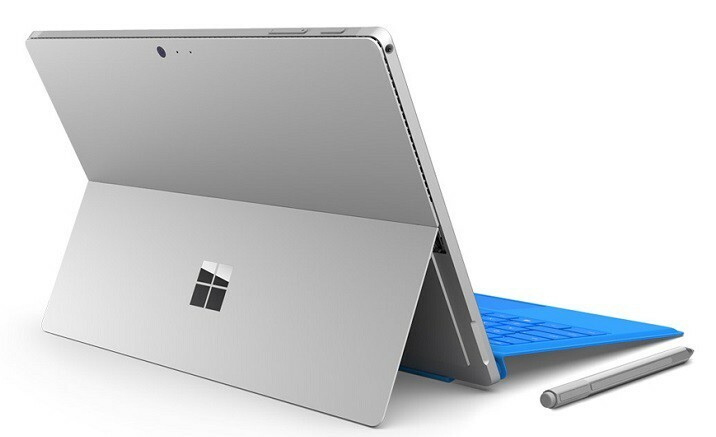 Surface Pro 4 is the latest and most advanced member of Microsoft’s Surface Pro family. But despite the fact that Microsoft puts huge efforts in making the device as stable as possible, the Surface Pro 4, just like every other tablet or PC powered by Windows 10 has its share of issues. One of the issues that has been bothering users ever since the Surface Pro 4’s release is the problem with waking up from sleep. Namely, a big number of users constantly report this problem, as it transforms into one of the most widespread problems of the device. However, there is a way to fix this issue, and today we’ll show you how to do it. Surface Pro 4 black screen of death – Some users are calling this issue a black screen of death, however, you can fix the problem simply by trying to force a restart. Surface Pro 4 won’t wake from sleep – There are many reasons that can cause this problem to occur, however you should be able to fix this problem by using one of the solutions from this article. Surface Pro 4 screen not waking up – According to users, sometimes your screen won’t wake up at all. To fix that, you can try using a keyboard shortcut and check if that helps. Surface Pro 4 not turning on, booting up – Not being able to turn on your laptop can be a big problem. If you’re having this problem, be sure to check our Unable to power on Surface Pro 4 article for more in-depth solutions. If Surface Pro 4 screen isn’t waking up, you might be able to fix the problem simply by using a single keyboard shortcut. Users reported that the screen doesn’t wake up from sleep, but you can fix that simply by pressing Windows Key + Ctrl + Shift + B shortcut. There are several other shortcuts reported that can fix the problem, such as Ctrl + Alt + Delete, Ctrl + Shift + Esc, or Power button and Volume + button. Some users reported that pressing Volume up and Volume down keys three times quickly fixed the problem, so you might want to try that as well. After using the shortcut, the problem should be resolved and everything will start working again. Few users reported that the Windows Key + P shortcut also solves the problem. It seems that the device changes the project mode automatically once you put it to sleep, causing your screen to go black once you try to wake the device up. To fix the problem, press Windows Key + P shortcut about three times, wait for a moment and your screen should appear. According to users, you might be able to fix this problem by using a simple and easy workaround. 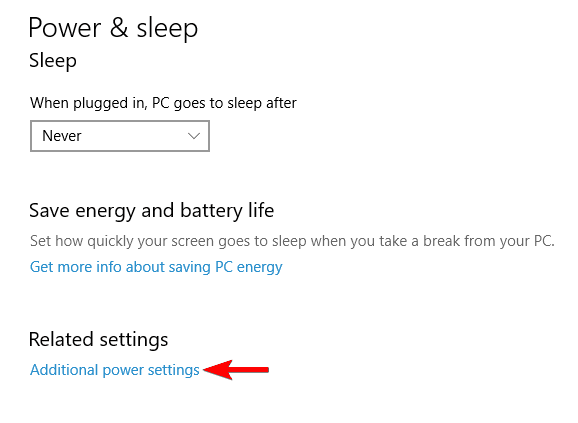 If Surface Pro 4 won’t wake up from sleep, you can try putting it to sleep by pressing the Power button. Users reported that waking up problems occur while closing the cover and putting the device to sleep. Instead of doing that, press the Power button to put the device to sleep and check if the problem reappears. If you’re having issues with Sleep Mode and Surface Pro 4, the problem might be your drivers. To fix this problem, you need to make sure that all your drivers are updated. Users are suggesting to install the latest drivers from Intel and check if that solves your issue. Alternatively, you can download all the missing drivers by using a third-party application such as TweakBit Driver Updater. Downloading drivers manually can be a tedious task, especially if you don’t know which drivers you need. However, you can update all outdated drivers automatically using this tool. 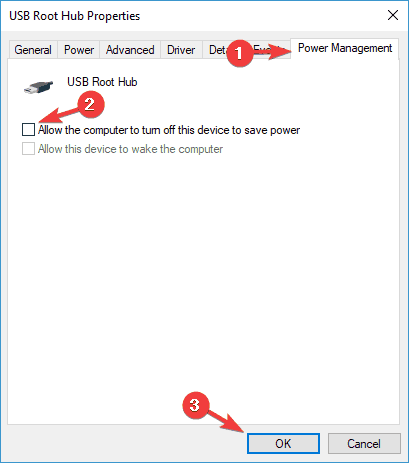 If your Surface Pro 4 can’t wake up, you might be able to fix this problem by connecting the charger. Connect the charger and make sure that the LED light is on. If the LED light won’t turn on, it means that the battery isn’t charging. Now press the Power button and check if your device wakes up. If nothing happens, it’s possible that your battery is empty, so leave it charging for 10-15 minutes and try again. Sometimes other devices can interfere with Surface Pro 4 and prevent it from waking up. To check if other devices are the problem, it’s important that you disconnect them and try waking up your device again. 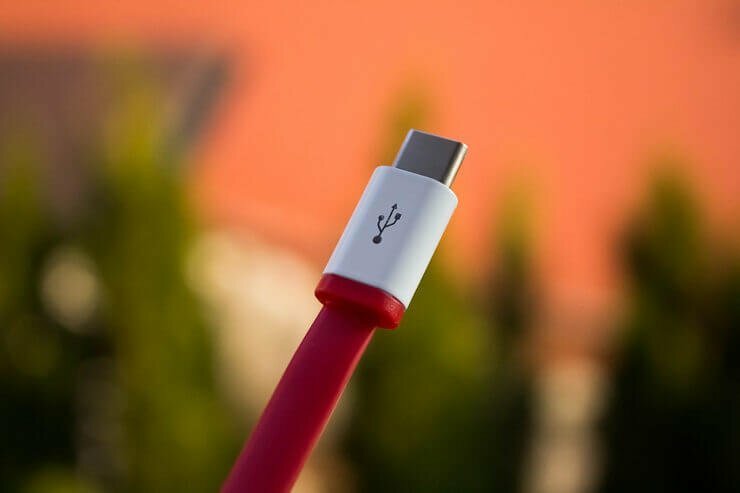 Typing Cover, microSD cards, external monitors, adapters and other USB devices can cause problems with waking up, so be sure to disconnect them. After doing that, try to start Surface Pro 4 again and check if the problem is still there. If your Surface Pro 4 won’t wake up at all, the only way to wake up your device would be to perform a forced restart. This is fairly simple to do, and you just need to press the Power button and hold it for 30 seconds or more. Some users are suggesting to keep the Power button pressed even if your screen starts responding. This is just a workaround, but if your PC can’t wake up from sleep, be sure to try this solution. Right-click the Start Menu and choose Command Prompt (Admin). Once you turn off the hibernation, put your Surface Pro 4 to sleep once again, and try to wake it up. If you still have problems, try some of the solutions listed below. If the previous solution didn’t get the job done, forget everything you read there, and do the exact opposite. 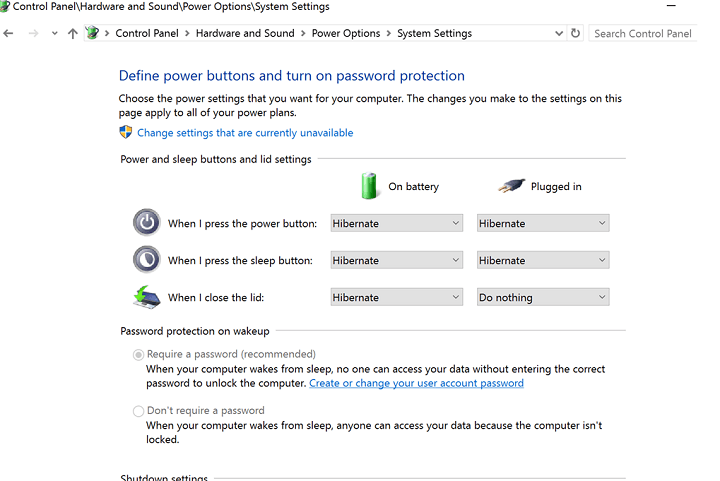 So, instead of turning of the hibernation, you should set all your power buttons to hibernate. Although it looks strange that we listed two solutions that negate each other, it actually makes sense, because the cause of the problem is different on different Surface Pro 4 devices. So, experiment with these two solutions, and hopefully, you’ll have your problem solved. 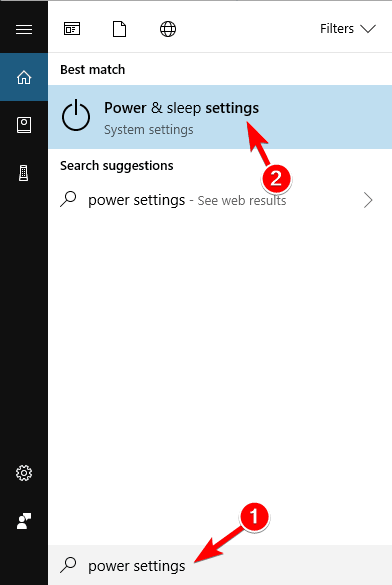 Go to Search, type power options, and open Power & sleep settings. Choose Additional power settings in the Related settings section. Go to the Choose what the power buttons does option from the left pane. Now set everything to Hibernate (as shown on the picture). This solution was confirmed by one Reddit user, so we can say it helped at least someone. Hopefully it will also help you, but if it doesn’t, try the other solutions from this article. Find the Surface Pro 4’s wireless network card, right click on it, and go to Properties. Now, go to the Power Management tab. 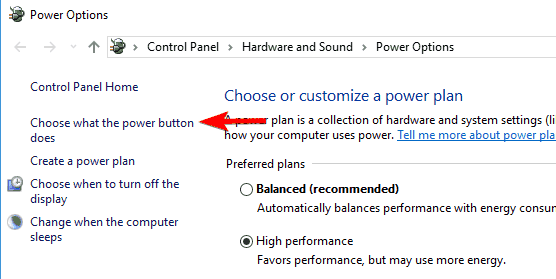 Make sure the Allow the computer to turn off this device to save power option is enabled. This solution also solved the problem for a few Surface Pro 4 users, and once again, we hope it will be helpful to you, in case none of the solutions above fixed the issue. One of the users who faced this problem said that he found out the Sign in settings on his Surface Pro 4 actually prevented the device from waking up normally. Now, go to Settings > Accounts. In the left pane, select Sign-in options. Under Require Sign-in, choose Never. 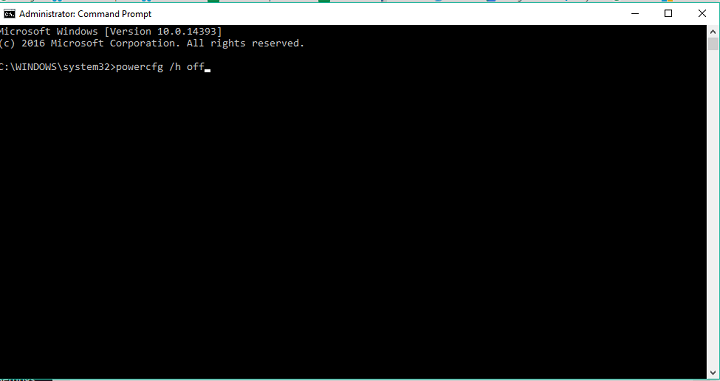 Restart your Surface Pro 4. That’s about it for our article about waking up issues on the Surface Pro 4. As we said, all these solutions were helpful for some users before, but as the issue is so wide-spread, we can’t guarantee that these solutions will work for you, but it’s worth giving a try. If you have any comments, questions, or suggestions, just let us know in the comment section below.